Literally the biggest book I’ve produced, this coffee-table tome features over 500 classic Marvel covers spread over 300 pages. The book took months of careful research, each cover coming with information and trivia about what makes it a classic. DK always have exceptionally high standards when it comes to book production and they’ve outdone themselves this time. 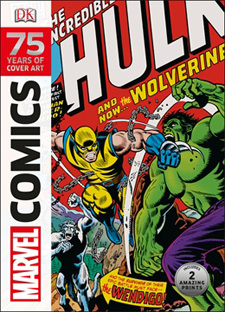 The book is split in to the four main ages of comics (Golden Age, Silver Age, Bronze Age and Modern Age), allowing the reader to see how Marvel’s cover art has evolved over the decades. The artists are the real stars of the show though, with covers from legends such as Jack Kirby, Steve Ditko, John Romita Snr, and Jim Steranko together with 21st Century masterpieces by modern maestros such as David Aja and John Romita Jnr.